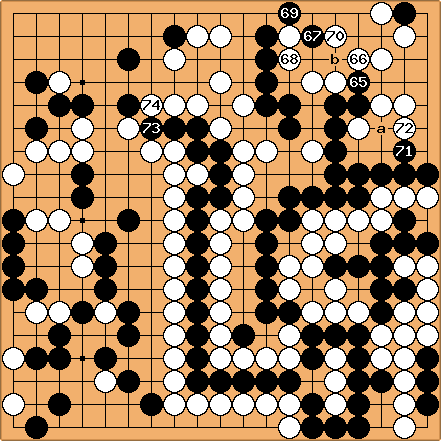 Let me give you a short introduction into what three amateurs think might be the solution of Igo Hatsuyoron's problem #120. I will not explain the standard moves of the "classical" solution, provided by Fusisawa Shuko 9p in 1982, in detail here. 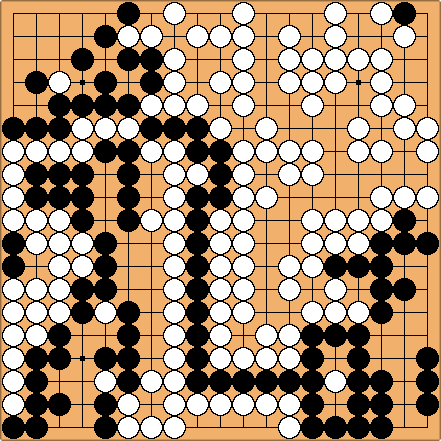 If you are interested in, please refer to http://www.dgob.de/dgoz/trmdpe/mainpath/03/index.htm, for example. We are unsure whether Black 19 might be played at 20 (= the second Throw-in, followed by W a - B 19 - W 20). We were unable to find the Semeai, mentioned by Fujisawa Shuko 9p, ending futile for Black thereafter. As far as I know, the exchange Black 21 - White 22 is shown in the Chinese edition of Igo Hatsuyoron. It prevents a later exchange of White 21 - Black 22 with Black's stone at 22 ending as additional White's prisoner in the Semeai variation. We think that Black must reduce White's top right corner, starting with Black 65, and play the Guzumi of Black 71 before playing the Crosscut sequence in the centre, starting with Black 73. 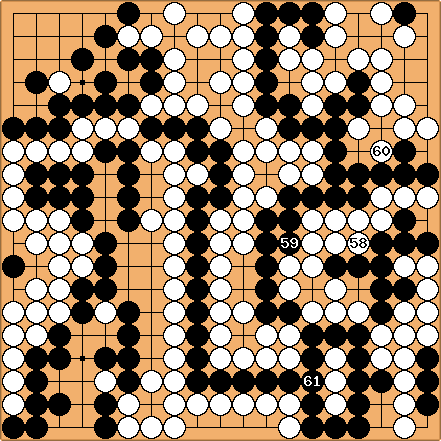 Black may choose the order of 71 - 65 - 67 - 69 for his moves in the top right. Black 67 is the Hasami-Tsuke of Harry Fearnley and can only be played in conjunction with my Guzumi at 71. 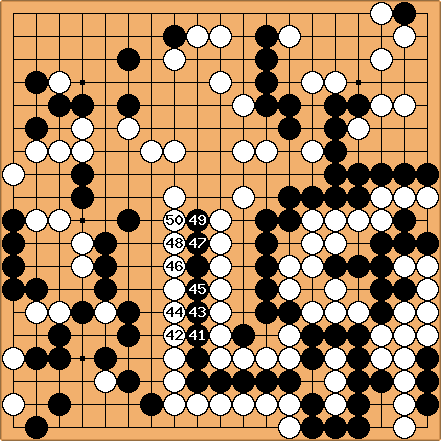 The two false Eyes at a and b provide Black's top right group with an additional external liberty, making it possible to connect his pivotal stones of 67 and 69 later. Why would White play 78 here? Why not capture the Black dragon and connect? Answer: see classical solution by Shuko. White 138 is the Tsuke of Yamada Shinki 5p. 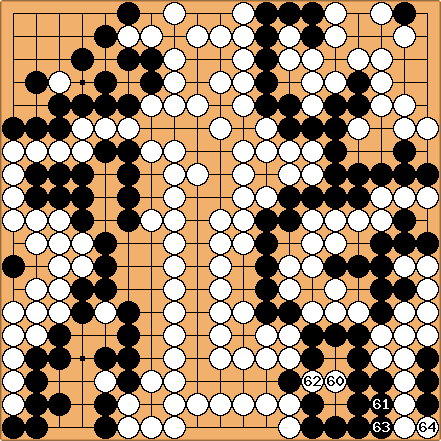 It can be played even at this early moment, because White could capture Black's centre string in Sente at any time she likes. 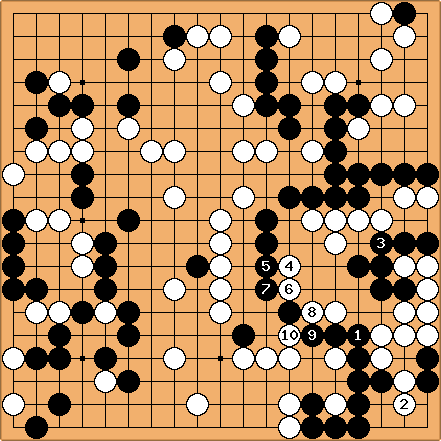 Black cannot resist with 139 at 140, because White would be able to reach a Seki in the top left corner thereafter. As ususal, the Endgame on the left can be finished first. Now a is the correct choice for White. White continues the Semeai with 158. 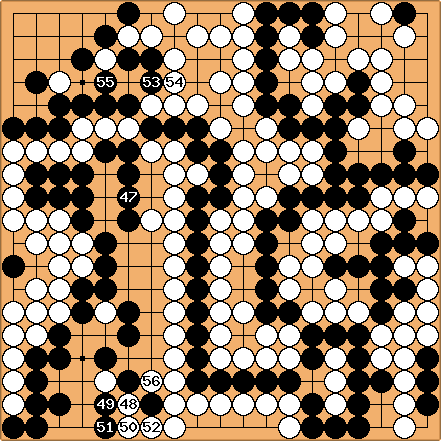 Black has 77 points of territory + 50 prisoners = 127 points in total. 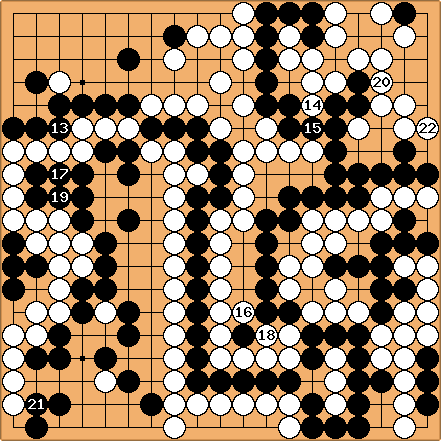 White has 62 points of territory + 63 prisoners = 125 points in total. Black wins be 2 points. The problem's setup contains 71 White stones, but only 70 Black stones. 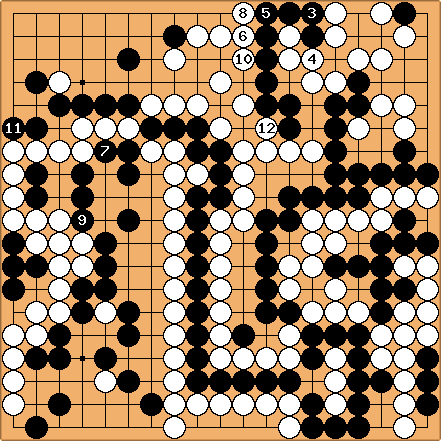 If we assume that a 71th Black stone at T6 got captured beforehand, the score would be Black + 1. White has captured Black's group in the top right, so none of Black's "reducing" moves there - because answered by a White one - do matter here. These reducing moves are necessary to prevent White from choosing the Capture variation, shown below. 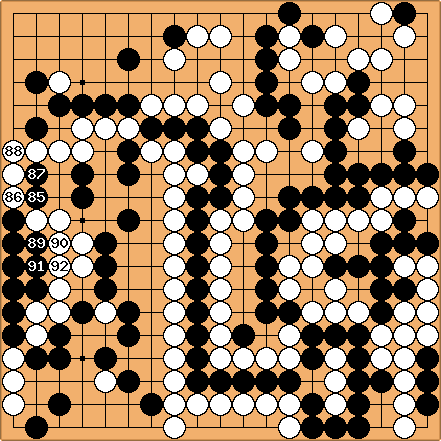 This White 158 starts the Capture version. White 160 is the Oki of Joachim Meinhardt, being the death blow to the "classical" solution. 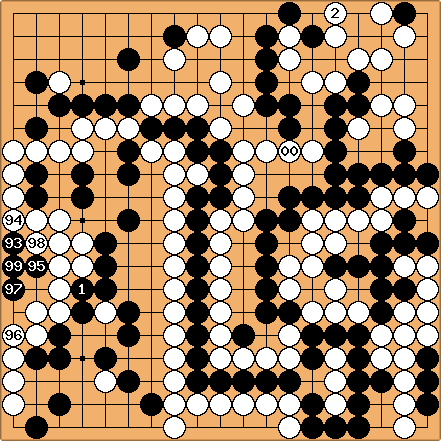 Black has 62 points of territory + 39 prisoners = 101 points in total. White has 48 points of territory + 48 prisoners = 96 points in total. Black wins by 5 points here. Please be aware that the Guzumi destroyed 3 points of White's territory in the top right and the Hasami-Tsuke 4 points, compared to the "classical" solution. Without these two moves (= the "classical" solution), White would win by 2 points, due to Joachim's Oki, which destroyed 4 points of Black's territory in the lower right.